If I ever questioned the ability of a sunny day to lift my mood, that doubt is gone — because the rain finally stopped this week. The sun came out and started drying the trails, making the mud more manageable. And boy, did we feel better. We actually enjoyed hiking again instead of merely gutting it out. We put in three solid days, two of them fairly long. In the process, we traveled through most of Vermont. 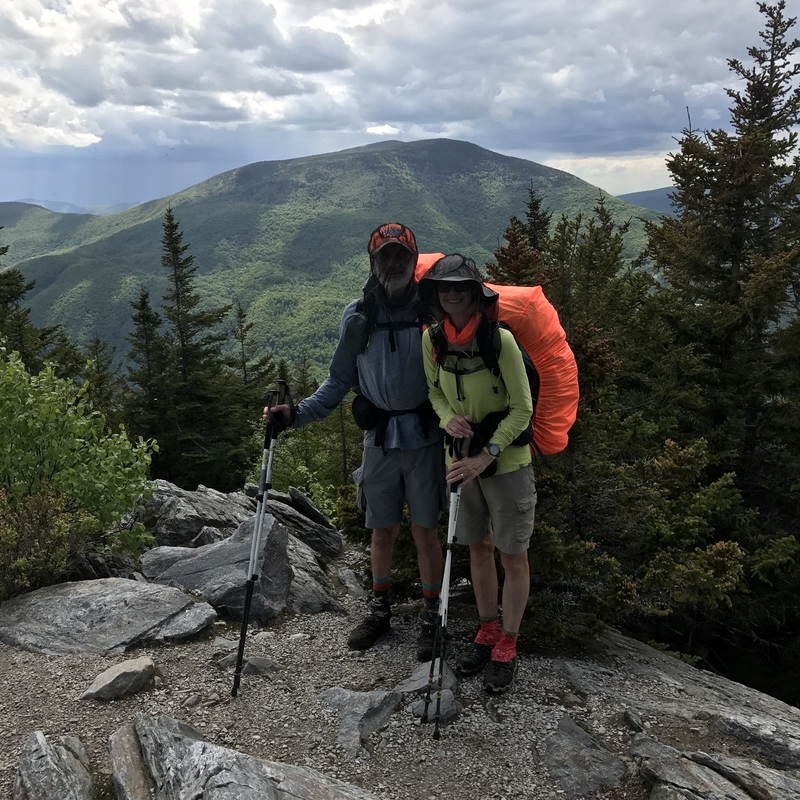 We trekked up a series of mountains: Bromley Mountain, Styles Peak, Baker Peak, Beacon Hill, and Pico/Killington Peak. The last one was the toughest, about 2,600 feet up and 2,000 down in one day. (Our knees weren’t happy about that, but it wasn’t as hard as we’d feared). Biggest discovery: Our bug nets work. We’d been warned that when the rain stopped and the wind died, the bugs would begin to come out — and they did. We had head nets in our packs but resisted wearing them, thinking they would limit our sight. When we finally put them on, though, we couldn’t figure out why we’d waited so long. They don’t bother us at all and work great. 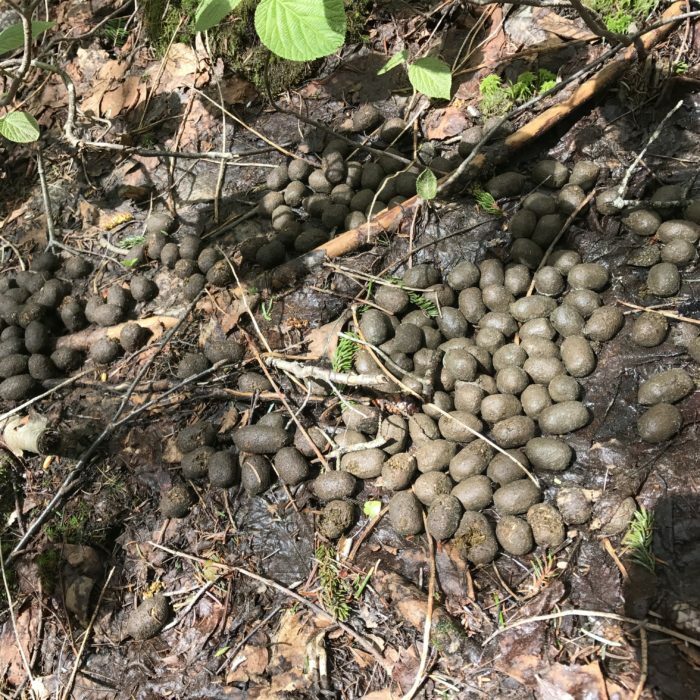 Biggest source of frustration: We traveled through prime moose habitat for days — thick pine forests filled with secluded ponds. We saw tons of their droppings along the trail, but never saw a moose. We haven’t given up yet, though. Scariest moment: Wet rocks are my nemesis. My balance and traction aren’t good, increasing the chance of a fall. Place those rocks in rushing water and you can imagine why my anxiety rises whenever we confront a stream. Usually I follow John across, carefully copying his steps while I try to stay upright, but this week we faced a stream I was just too scared to cross. So I decided to scoot across on a fallen log (straddling it) instead. It wasn’t easy, especially with a backpack making me wobble with every move and the racing water below me giving me vertigo. (I wish I had a photo, but John was too busy standing watch in case he needed to dive in and rescue me.) In the end it worked and felt marginally safer than trying to go over the rocks. But bark is incredibly rough, and it hurt like hell. Most amazing moment: At the top of Mt. Killington I ran into Ilse Dunbar, a Facebook friend who has been following my posts and recognized me. Seriously, what are the chances of that happening? It was so cool to meet her and totally made my day. 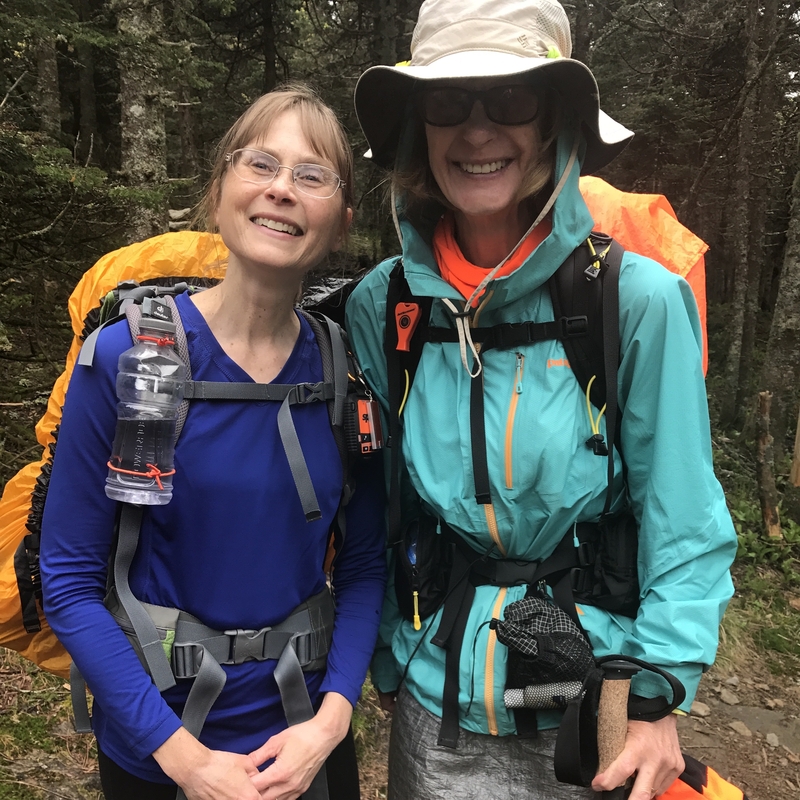 Highlight of the week: We decided to do Killington Mountain in one 18-mile day so we could make it to the Inn at Long Trail for a shower. When we got there, we discovered that not only is there an Irish pub inside, but they were featuring live Irish music that night (which I love). 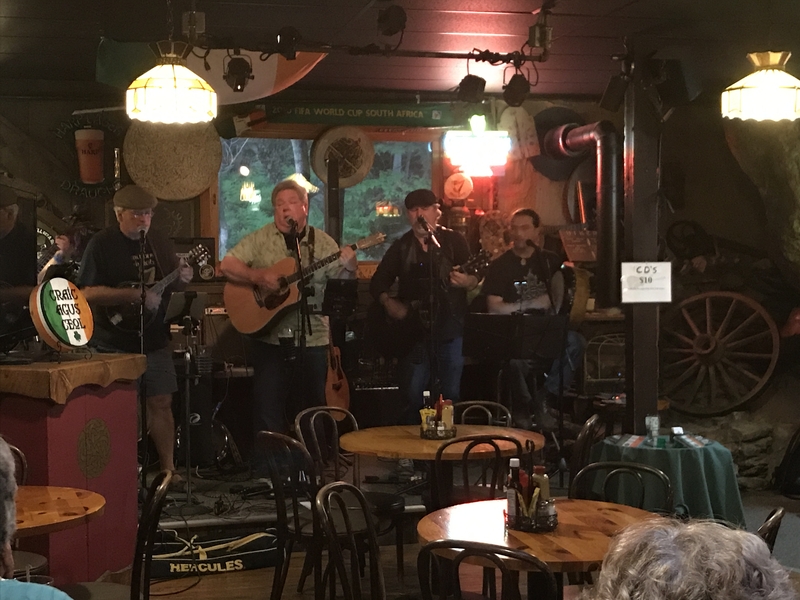 So we spent a great evening listening to the fabulous band Craic agus Ceol — the perfect ending to an upbeat week. Now for the next phase. Unfortunately, they’re predicting heavy rain in the days ahead. But that sunshine sure was nice while it lasted. Too bad it couldn’t have hung around for a few more days! Hi, everyone! 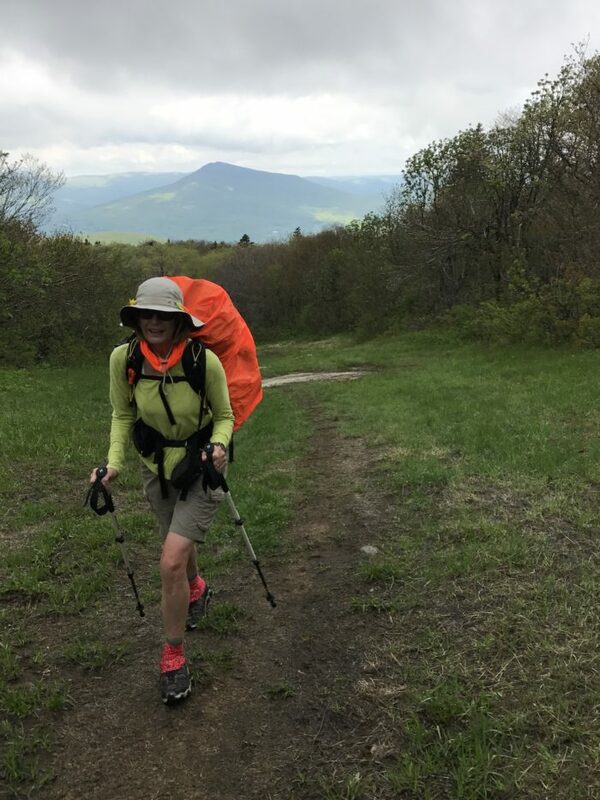 I’m a 63-year old romance novelist whose thru-hike was derailed by injuries last year. Now I'm back, inching my way along the remainder of the trail because, apparently, I'm too stubborn (or foolhardy) to give up. I hope you’ll join me on my trek. Glad to see you guys made it past Killington! I’m sure you were thankful for some of that mud to clear up– couldn’t imagine another day like it..
My knee is finally starting to feel better. Still hurts when I stand up, but I’m improving every day..
Ryan, I’m glad to hear that your knee is improving. If it only hurts when you stand up, you’re good to go! ? Oh – funny story. When we were sitting in the pub listening to the Irish music our legs really stiffened up. We’d hiked over 18 miles that day with a lot of elevation and were in tremendous pain. At one point John walked up to a little table the band had set up near the stage to get their business card, but his legs locked up so he could hardly even stagger across the room. One of the band members thought he was drunk and announced to the audience that John needed another drink!!!!? LOL! Too funny.. that’s a lot of miles for that kind of elevation gain/loss… and then for him to do it all over again shortly afterward- really admire that. I’m actually planning on doing about 17 more miles from Stratton Arlington Rd to the bromley area later this year over a long weekend. 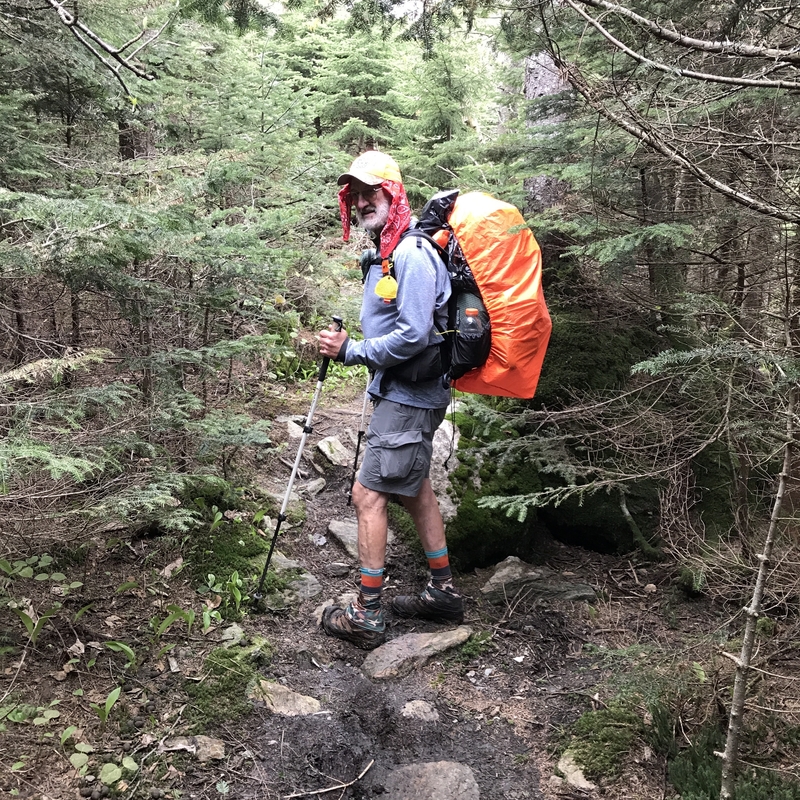 I’ll see how many years it takes me to section hike the long trail. I’m determined though!